Why does Destination BC host familiarization trips (also known as FAMs) and what are the outcomes of trips like this? Destination BC and key partners often host journalists, editors, travel agents, product managers, marketing managers or reservations staff from tour operator partners. The intent of these trips to provide attendees with a level of understanding about what BC has to offer as well as inspire them to sell or write about the destination more knowledgably (when they often sell or write about hundreds of destinations around the world). Learn more about FAMs in BC. The Destination BC UK team held an educational quiz for Trailfinders, consistently one of the biggest tour operator partners and producers into British Columbia from the UK, which shared BC facts to attending staff in London. A German documentary team filmed in the Kootenay Rockies in rare boreal forest from 2016-2017, and the subsequent film “Black Forest” is being released. The dark woods in British Columbia’s Kootenay Rockies is a 55,000 hectare sized remote area that was owned for many years by the German Carl, Duke of Württemberg who managed it with sustainability in mind. He named it Darkwoods after his home mountain range Schwarzwald. Home to the very rare boreal woodland cariboo, wolves, and grizzlies, the area is owned by the Nature Conservancy Canada (NCC). 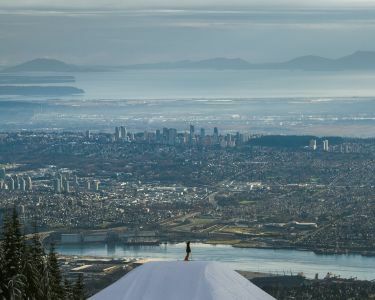 November and December 2018 saw many FAM trips from Australia, sharing the idea of experiencing Winter in BC/pre-Christmas and non-ski activities. The team hosted: 10 retail travel agents from Flight Centre stores in New South Wales, who visited Whistler and Vancouver on their FAM; 10 retail travel agents who were part of the Canada Specialist Program from across Australia, visiting Victoria, Vancouver and the Kootenay Rockies; and 8 top travel trade clients in Vancouver, Whistler, Victoria, and Field at Emerald Lake Lodge. Feedback from the trips included the following: “If you’ve been to Canada in summer you’ll know the scenery is spectacular, but to visit in winter is truly magical”. 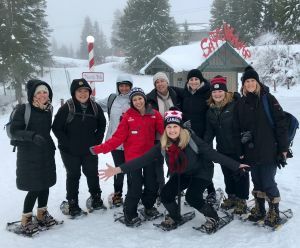 Photo: Product Managers snow shoeing Grouse Mountain.